Some examples of Sheila’s work. Sheila Oehm, from Wagga Wagga, was a long standing member of the Enamellers Association. 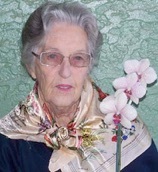 She had been a keen enameller for many years until ill health and a passion for growing orchids diverted her interest. In the war years Sheila had been a munitions driver, and became a strong supporter of local community causes. Sheila died in March 2009, and was laid to rest beside her late husband, who had died 46 years earlier of war related injuries. May they now be at peace together.